Robert Gene Rhodus, age 75, husband of Marilynn Kay Eden Rhodus, passed away December 31, 2018 at Saint Joseph Berea Hospital. Robert was born February 22, 1943 in Winchester, Ky., to the late Carl and Lillie Mae Rogers Rhodus. Robert was a metal heat treater with National Metal Processing and retired after 33yrs of service. 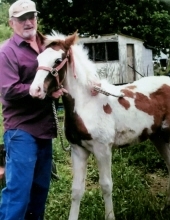 He was a Poultry and Rabbit Judge for 16yrs with the Ky State Fairs and surrounding Counties. He loved his grandchildren dearly. Robert attended Middletown Baptist Church. Other than his wife Robert was survived by his children, Kathleen “Peach” Newby and her husband Dwayne of Paint Lick, Ky., Bobbie Joyce McCracken of Berea, Ky., Elitha Faye Caudill and her husband Richard of Berea, Ky., grandchildren, Joseph Mitchell Smith and his wife Deanna, Kathy Jo Richardson, Derrick Robert Rhodus, Jacob Carl Caudill, Cheyenne Hope Caudill, Great grandchildren Tyler, Tristan, Lomae, Wyatt, Colby, Lily Grayce, and sister Lois Faye Evans of Berea, Ky. Other than his parents Robert was preceded in death by a grandchild Savannah Faith Caudill. Funeral services will be 1:00PM Friday at Davis & Powell Funeral Home with Rev. William Dooley and Rev. Darrel Eden officiating. Burial will follow in the Madison County Memorial Gardens. Pallbearers will be, Dwayne Newby, Derrick Rhodus, Richard Caudill, Jacob Caudill, David Eden, Jimmy Darrell Harris, Ray Calico, Wayne Seals, and Roger Dale Seals. Honorary Pallbearers are, Eden Kay Lewis, Kathy Jo Richardson, Cheyenne Hope Caudill, Tristan Richardson, Wyatt Richardson, and Lily Grayce Rhodus. Visitation will be Thursday from 5-9 PM at the funeral home. To send flowers or a remembrance gift to the family of Robert Gene Rhodus, please visit our Tribute Store. "Email Address" would like to share the life celebration of Robert Gene Rhodus. Click on the "link" to go to share a favorite memory or leave a condolence message for the family.